Editor's note: This piece was added by popular demand to Joe's final WILT (Dec 2017). Click here to visit the WILT archive. The vodka martini has been a popular drink for quite a long time, and so has predictably fallen out of favour with the 'craft cocktail' crowd. Some very cool bars even refuse to stock vodka, on the grounds that it's pretty flavourless (they've got a point there) or that their customers need to be educated (hmmm). But personally I still find the 'vodkatini' a splendidly bracing apéritif, and not bad on other occasions, too. If a cocktail hipster ever makes a martini, it will almost certainly be made with gin, and to a hundred-year-old recipe. Fine. I respect tradition too. There's just something about gin which doesn't agree with me. If you can stomach the stuff, though, all you have to do is substitute it for vodka in the recipe below. I generally agree with the wit (I wish I could remember who it was) who said that martinis are like women's breasts: one never seems to be enough, but three would be too much. However, I disagree with James Bond, who may have had a license to kill, but should never have had a license to chill. A martini should be stirred, not shaken. Shaking is for drinks with ingredients that need aggressive blending (fruit juice, sugar, egg, cream, etc) or need to be 'frothed up'. A margarita or a Pisco Sour demand to be shaken. But a martini should be clear, clean, and ice cold. If a bartender thinks he's doing you a favour by serving you a murky stew of tiny ice chips and bubbles, you are in the wrong place. Since you're not shaking, you don't really need a shaker; a glass pitcher is nice, but you can use a pint glass, or a teapot for all I care, so long as you have a strainer that will work with it. If you have a shaker with a strainer-top, you can put the top on just for the pour. Either way, you also need a long-handled bar spoon for stirring. I do think you need a martini glass. These always take the same general form, but come in a surprising variety of shapes and sizes; try to get a chunky one with a fairly short stem, and not too wide across the top. Department stores tend to sell very tall, flaring glasses with thin stems, which are supposed to look elegant but are actually harder to balance and drink out of. Keep your glasses in the freezer. If you have to work with room-temperature ones, chill them for at least ten minutes by filling them with ice and then adding water up to the brim (which conducts the cold better than ice alone). I like a 7 or 8 oz. glass myself, but some people feel that a smaller one is better for maintaining the icy cold of the drink (and perhaps, enabling you to have one more). You also need a sharp knife, and a good sharp potato or vegetable peeler for your lemon twist. Your vodka can also be kept in the freezer, and should be of decent – that's to say, triple-distilled – quality, but doesn't need to be expensive. Stolichnaya is my default choice, but I also like Green Mark, and some reasonably-priced brands like Finlandia, Skyy, and Smirnoff (red label) are quite acceptable. Polish vodkas like Sobieski and Luksosowa are good quality and good value. Absolut has great marketing but is overrated, it always tastes a bit weird to me. Grey Goose is very good but overpriced. As for the various 'super-premium' brands: forget them, they are for Russian gangsters, not people like you and me who just want a nice drink. Your vermouth should be either Dolin Dry or Noilly Prat Extra Dry. (Note that there is no connection between the martini cocktail and the brand name Martini & Rossi, though M&R do make an extra dry vermouth which can be used in case of emergency). I like the freshness of a lemon twist, for which you need very fresh, 'hard' lemons – you can keep them in the fridge. (As they ripen, the peel gets too soft and hard to work with). If you prefer an olive or olives instead, go for it; it's certainly traditional, but I personally feel it gives the drink an overly 'vegetabley' flavor. (As for the funky, briny Dirty Martini, all I can say is that it makes a good song title). Finally, the Optional Secret Ingredient (about which, more in a moment): orange bitters. Angostura Orange (not Aromatic!) Bitters are ideal, somewhere between the slightly too artificially-sweet Fee Brothers and the sharper, spicier Regan's. Like many things in life, the martini is simple, but can be elevated into something special by the accumulation of a few small details. First, if you're using a 7-8 oz. glass, pour 5-6 oz. of vodka over ice in your preferred mixing vessel. I tend to just judge the amount visually – you can also use the glass itself to measure it. Now comes the controversial part. For a long time, people have been drinking their martinis drier and drier – that is, with less and less vermouth. There are lots of droll stories about needing nothing more than a ray of sunlight passing through the vermouth bottle, and so on. Well, I like a dry martini myself, but I think the right amount is 'just enough to taste' (as opposed to 'oh, there's vermouth in here?') For a 6 oz. drink, I think that means about a teaspoonful. One caveat, though: don't pour the vermouth straight out of the bottle. One slip, and your drink is ruined. Better to first decant some into a smaller and more controllable vessel: bartenders often use small bottles of the type more commonly used for splashing oil or vinegar onto food. But you can use a jigger, a teaspoon, an eye-dropper, a little plastic squeezy bottle, or my moving-tour-bus method, which is to pour a bit of vermouth into its own bottle-cap, and then drip it carefully into the drink. Don't worry about not using enough: if you decide you'd like more, you can always add a few drops to the finished drink. 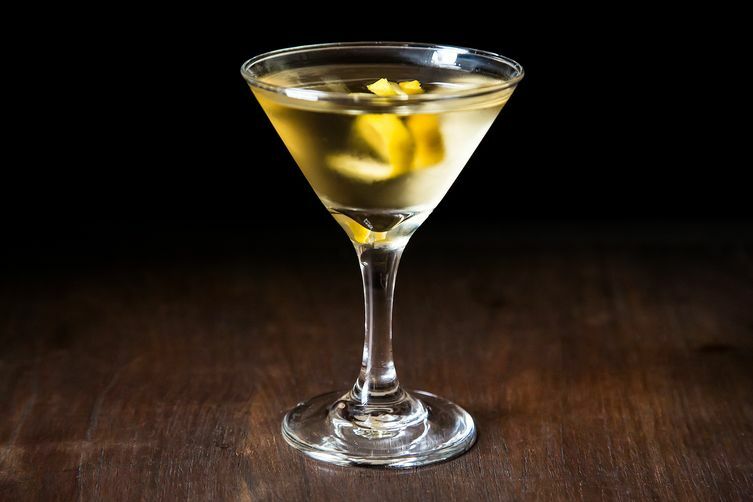 (If you like a really dry martini, two other methods deserve an honourable mention: (1) the 'in-and-out', which involves splashing some vermouth over ice, stirring, and then straining it out, leaving the ice 'coated' with just enough; and (2) the 'in-the-glass', in which a splash of vermouth is simply swirled around in the glass and then jettisoned before pouring in everything else. When in doubt, experiment; there are worse ways to pass the time). Incidentally, vermouth should be kept in the fridge, and for no more than about a month. You'll probably end up chucking out some or most of it, especially if it's a full-size bottle (half-bottles being for some reason harder to find). It doesn't matter. It's cheap. What many people don't realize is that vermouth is a 'fortified wine', not a spirit, and it will go off. If you've ever had a martini that tasted vaguely of damp cardboard or old gym socks, it was probably made with vermouth that had been sitting on a shelf since last Christmas. Now, that optional secret ingredient: a couple of dashes of orange bitters. Not many bartenders do this, but orange bitters were once a common ingredient in martinis, and many other drinks, and are making a comeback. It's a subtle touch, but it seems to combine with the vermouth and lemon in an interesting way, and livens the drink up just a bit more. I'm also of the school of thought which believes a martini should contain just a bit of ice-water, which softens the 'edge' and makes it a touch smoother. How you achieve this depends on how much you stir, and crucially, on your ice. If it's 'wet' (i.e. not very cold and quickly melting) you need just a quick 'swish-around', for about 5-7 seconds. If the ice is 'dry' – super-cold and not melting – I will actually let the mixture sit for a couple of minutes, while I'm picking out some music, checking email, powdering my nose, etc. Then stir for 10-15 seconds. Take your glass out of the freezer (or pour out the ice you're chilling it with). Cut the end off a lemon and rub the juicy bit around the rim of the glass, gently enough to add a hint of flavor without leaving juice running down the sides. Strain the drink into the glass. Finally, the lemon twist. With the peeler, pare off a strip (it's easier if you use a second lemon). It should come out about ½" or a bit more wide, and 1½" long. 'Dig in' enough so that it's not too thin, but doesn't have too much of the white stuff on it either. Now, hold the twist yellow side down, with the first two fingers of each hand on one side, and the thumbs on the other. Gently press a few times on both sides, to release a fine mist of lemon zest into your drink. Then carefully twist the twist, and drop it in. Life is about to get so much better. Cheers!